Farmers are asking for a higher minimum support price, something that the government claims to have already provided. But how it is being calculated is crucial. New Delhi: A day after the ten-day farmer strike began in several states across the country on June 1, Radha Mohan Singh, Union minister for agriculture and farmer welfare, mocked the protesting farmers, saying that organisations with scant following are resorting to “unusual deeds” to “appear in the media”. The man in charge of the welfare of farmers across the country was implying that there is no real reason for farmers to be protesting. This, after having seen massive farmers’ protests across the country over the last year, starting with the Madhya Pradesh and Maharashtra agitations of last summer where six farmers were killed in police firing and reaching a crescendo with the Kisan Long March this year where 35,000 farmers marched from Nasik to Mumbai. 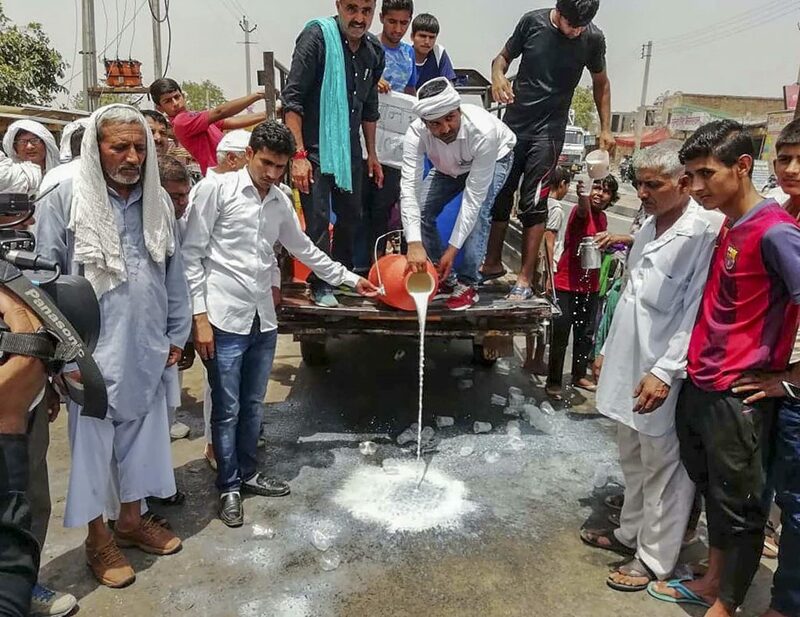 And now, thousands of farmers across the country are participating in ‘gao bandh’ (village shutdown) protests by stopping the supply of fruits, vegetables and dairy products to cities. So why have farmers across the country been agitating? An oft-repeated demand at every farmers’ agitation is the implementation of the recommendations of the National Commission on farmers headed by M.S. Swaminathan, known for his pioneering role in India’s Green Revolution, which submitted its report in 2006. The key recommendation – which has been the focal point of all farmer agitations, including the present-day gao bandh – was that the minimum support price (MSP) be set at cost plus 50% of the cost. For instance, if the cost of production is Rs 100, MSP should be set at Rs 150. Responding to the demands, Arun Jaitley in February, while presenting his fourth budget as finance minister, announced that his government had decided to set MSP at 1.5 times the cost of production. However, a careful reading revealed that the cost of production the finance minister had in mind was substantially lower than the one recommended by the Swaminathan Commission. The Commission for Agricultural Costs and Prices (CACP), which declares MSP for the 23 eligible crops, has three different definitions of production cost – A2 (actual paid out cost), A2+FL (actual paid out cost plus imputed value of family labour) and C2 (comprehensive cost including imputed rent and interest on owned land and capital). As is evident, C2 > A2+FL > A2. While the Swaminathan Commission recommended that MSP be set at C2 plus 50%, the government had only announced that MSP will be set at A2+FL plus 50%. As is evident from the above table, the difference between C2 and A2+FL can be substantial, implying that MSP for eligible crops will vary significantly depending on which cost is taken into account. Jaitley’s announcement that MSP has been increased to ‘1.5 times the production cost’ was misleading. In fact, going by Jaitley’s formula, there would not be any increase in the MSP for most crops. The table above shows that for the 2017-18 rabi season, MSP was already higher than 1.5 times the A2+FL for most crops, thus making the government’s announcement hollow and its claim of increasing MSP curious. This is why farmers are still demanding what the government claims to have already provided. How effective is MSP to begin with? A 2016 NITI Aayog evaluation report on MSP noted that 79% farmers responded in the negative when asked if they were satisfied with the MSP regime. Some of the reasons for their dissatisfaction were delay in payments, lack of infrastructure at procurement centres, distance to procurement centres and delayed announcement of MSP rates. Farmers have also claimed that the prices in wholesale markets are often lower than the MSP set by the government. 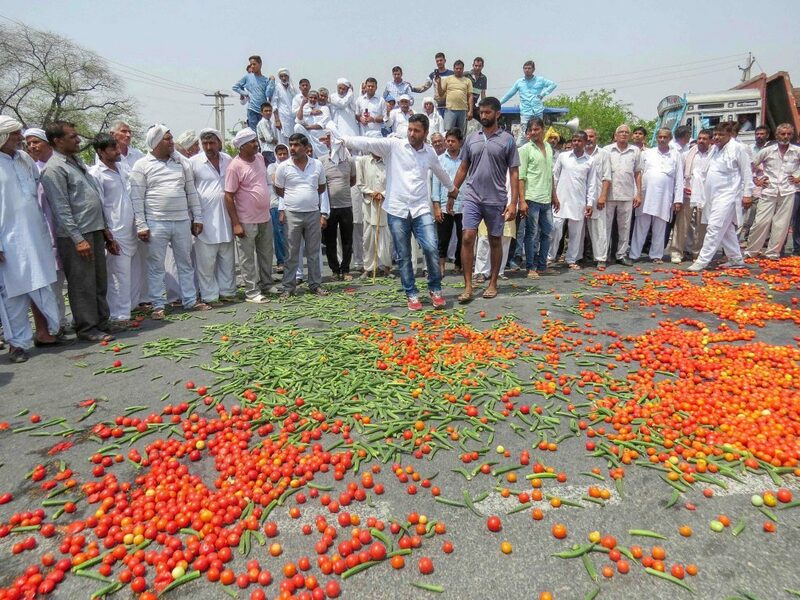 Kuldeep Tyagi heads the Bhartiya Kisan Andolan, which is active in western Uttar Pradesh, and has pointed out that the wholesale prices for several crops are lower than the MSP announced by the government. “For several crops such as masur, channa, arhar, the prices are much lower than MSP in most mandis. Farmers are forced to sell at 30-40% less than the MSP. In such a scenario, whatever MSP the government declares might not matter much. It also needs to work on the procurement infrastructure,” Tyagi said. 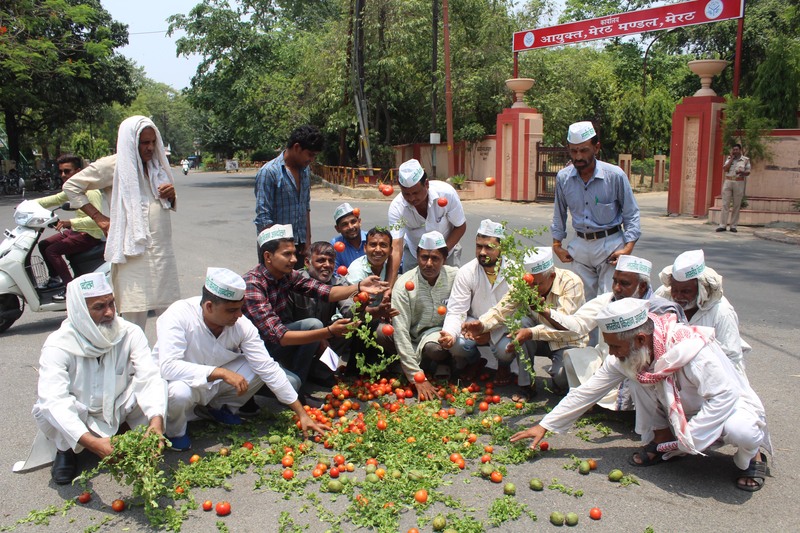 Yogendra Yadav, who is heading a grassroots farmers’ movement, Jai Kisan Andolan, has pointed out on several occasions that the wholesale prices at a number of mandis for several crops have been lower than the MSP announced by the government. In Madhya Pradesh and Uttar Pradesh, for instance, Yadav’s organisation found that in April, the wholesale prices were between 16-27% lower than MSP for masur. “The market price for each crop is lower than the MSP. Farmers are being looted by various methods. Government only starts procuring several days after the crop starts coming in. Farmers cannot afford to wait. They sell to traders who take advantage of their situation. Then, there are not enough procurement centres and the few that are there are oddly located,” Yadav told The Wire in March. Data released by Radha Mohan Singh’s own ministry reveal that prices have been lower than MSP for certain crops. For moong, in the 2016-17 season, prices in ten states were lower than the government declared MSP of Rs 5,225 per quintal. In Madhya Pradesh, prices were as low as Rs 3,700 per quintal. Another problem with the MSP regime is that its benefits – if and when they do accrue – reach only a small fraction of India’s farmer population. According to a survey conducted by the National Sample Survey Office (NSSO) in the 70th round, only 6% of farmers are able to sell their produce at MSP. Extrapolating the data of the NSSO, a study by K.S. Aditya, S.P. Subhash, K.V. Praveen, M.L. Nithyashree, N. Bhuvana and Akriti Sharma has inferred that only 24% households, at the most, are aware about the MSP of crops grown by them. “Although MSP is announced for the whole of India, the operation is limited only to few states where the designated government agencies procure the produce from farmers,” the study stated. “Except for crops like rice and wheat, quantity procured is very limited leading to low level of awareness,” it added. Awareness levels in Maharashtra, a state that has seen several farmer protests in the last year, are 8% for rabi crops and 8.19% for kharif crops, implying that about 92% of the farmers in the state were unaware about the MSP for their crops. A consistent demand of farmer organisations has been a one-time unconditional complete loan waiver. The Bhartiya Janata Party, which is in power at the Centre and in 21 states, has positioned itself as being opposed to loan waivers in principle. However, on occasions, like in Maharashtra – in response to a farmer agitation last year – and in Uttar Pradesh – in the hope of a few percentage point vote swing – the party has announced loan waivers giving rise to more such demands across the country. Moral hazard, in a similar vein, is a term used by economists to describe a situation where insurance against a particular risk encourages people to act more rashly. In the loan waiver scenario, theoretically moral hazard arises when due to the existence of a possibility of a loan waiver, people start borrowing larger amounts than they normally would and people who otherwise would not borrow also start borrowing, expecting a loan waiver in the future. In response to the economic argument against farm loan waivers, farmers’ leaders have pointed out that economists and bankers refrain from using the terms ‘moral hazard’ and ‘credit indiscipline’ when it comes to corporate debt write-offs and corporate debt restructuring. “When loans of big industrialists are written off, the economists do not talk about these issues. There is an inherent bias against farmers even when the amounts owed by corporates are much more than the amounts owed by farmers,” said Tyagi. Purely technically, Tyagi is wrong to equate loan write-offs and debt restructuring with loan waivers. Debt restructuring involves either a reduction in the rate of interest or an extension of the time period of the loan or both. A write-off entails removal of a loan due from the assets of the bank’s balance sheet when no dues have been recovered for a while turning the asset into a non-performing asset (NPA). In both cases, technically, the loan due is still recoverable, unlike in loan waivers. The crucial figure thus is what percentage of loans written off, which remain recoverable, are actually recovered. The government told the parliament in April this year that between April 2014 and December 2017, public sector banks (PSB) wrote off Rs 2,72,558 crore worth of loans. The PSBs recovered Rs 29,343 crores – a mere 10.7% – of the loans that had been written off. “What now of moral hazard and credit indiscipline? The doublespeak of the government and economists is abundantly evident,” Tyagi said.